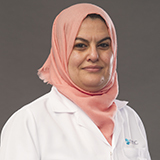 Dr. Ban Amer has obtained her M.B.B.Ch.B.in the specialty of obstetrics and gynecology in the year 1995 from AlMUSTANSERYA University, Baghdad, Iraq and Gynecology Diploma in year 2002 from the same university. She has an excellent & impressive track record of over 21 years of practice as a Specialist Obstetrics and Gynecology in Iraq, Oman and UAE. Dr. Ban has participated in numerous international conferences & workshops. Her main fields of special interest are infertility, hysteroscopy and laparoscopy. Dr. Ban has effective communication skills with her patients, fluent in English, Arabic and has in depth experience of working with GCC nationals, other Arab expatriates & various other nationalities.